A new month with new challenges! March has brought some really interesting new challenges – all of which seemed to start with the letter M! 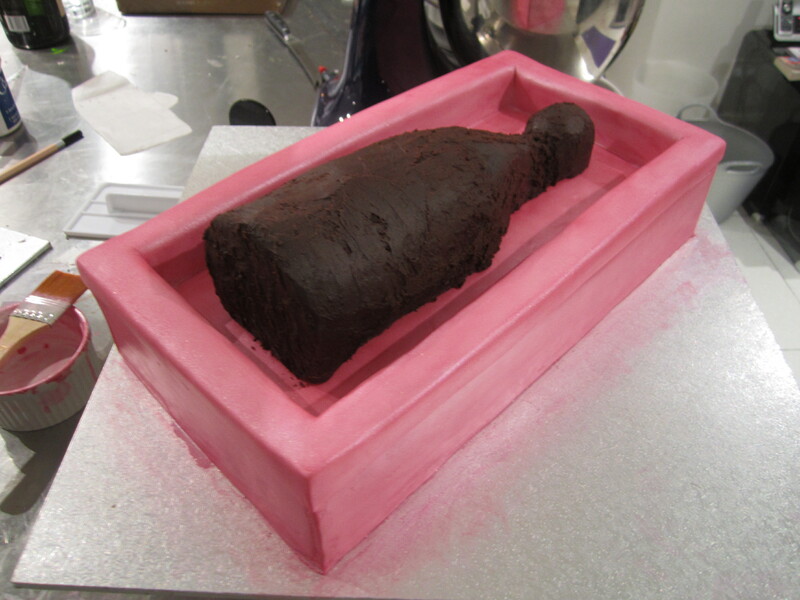 I got a call from one of Mr Cakespeare’s bosses a few weeks back about a cake he wanted me to make for his wife. The brief? 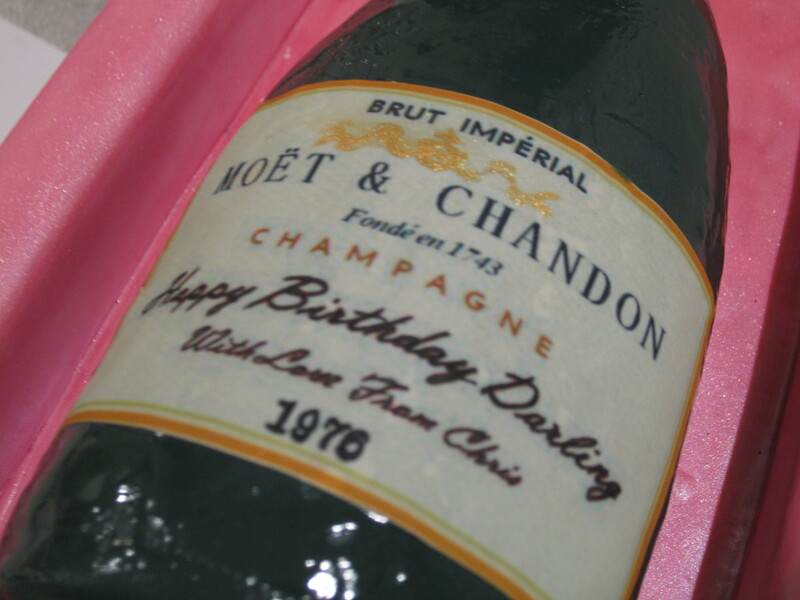 “Just a simple standing Moet & Chandon bottle with a box of chocolates that were actually made out of cake”…. Easy in concept, slightly trickier in execution! The box was originally designed to be a wooden box but I decided that was too boring and went instead for a pink gift box. We then decided to substitute the chocolates for chocolate cake pops wrapped in Lindt wrappers (Lindt was the birthday girl’s favourite chocolate) as a bit of a special extra something and gave it a more vintage girly feel which is very much Anna’s style. Carving the box with a 3cm rim was also a bit tricky and needed to be very precise because of the fragility of the structure. 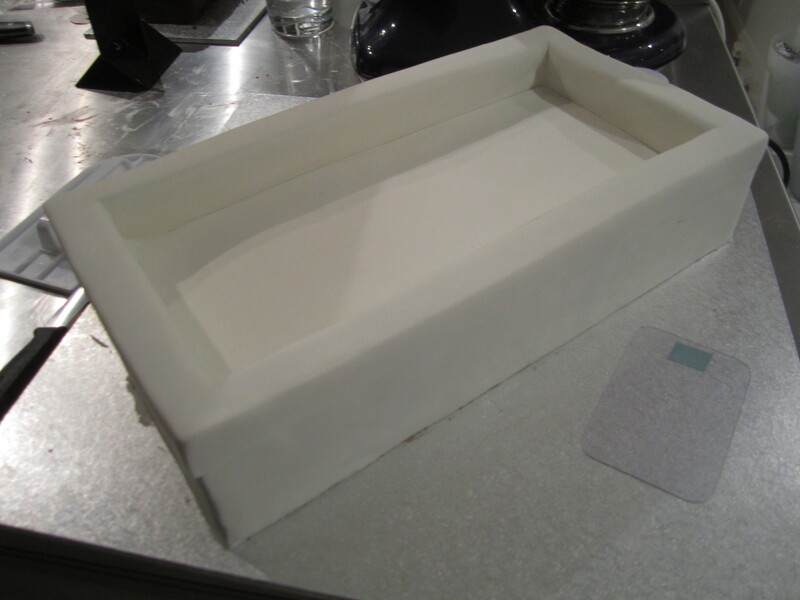 I managed to cover the whole top and rim in 1 piece of fondant and cut the edges freehand to make it look like a lid.. Believe it or not the part I actually struggled with the most was not the piping or the box or the bottle but what to put AROUND the bottle to make it look like the stuffing or straw you see in gift boxes… I made 3 different types of stuffing before I went for plain white to offset the pink and match the lace piping..
Now I have to confess that the box MAY have got slightly squashed at times because I was piping at around 1am at night…. and on occasion forgot about where I was resting my hand…. yikes. So the edges aren’t as beautifully straight as I would have liked. The second hardest part was the label which would either make or break this design as it’s instantly recognisable and yet we also wanted to customise it with Anna’s birth year and a special message. 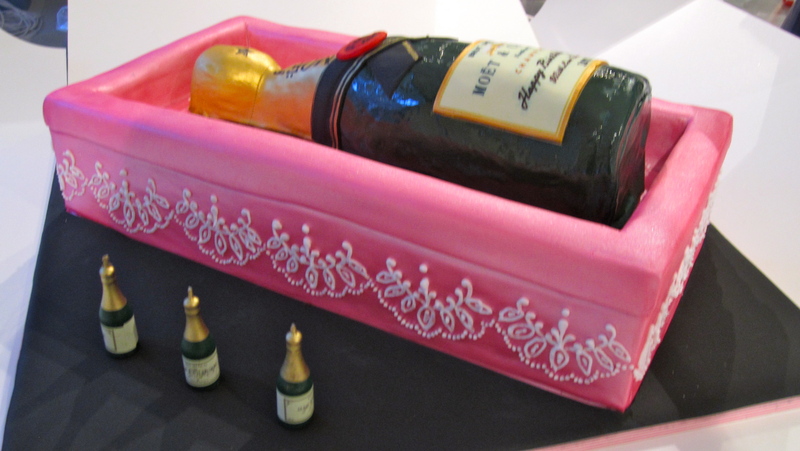 I ended up designing it from scratch in powerpoint (yes in typical management consultant style) and then getting it custom printed by a cake decorating supplier. The message and writing were hand written which I’m pretty proud of! Overall I thought it looked quite good… the humidity was a total killer and I think my airconditioning bill alone to keep the bottle from melting probably ate up whatever margin I may have made on this cake. 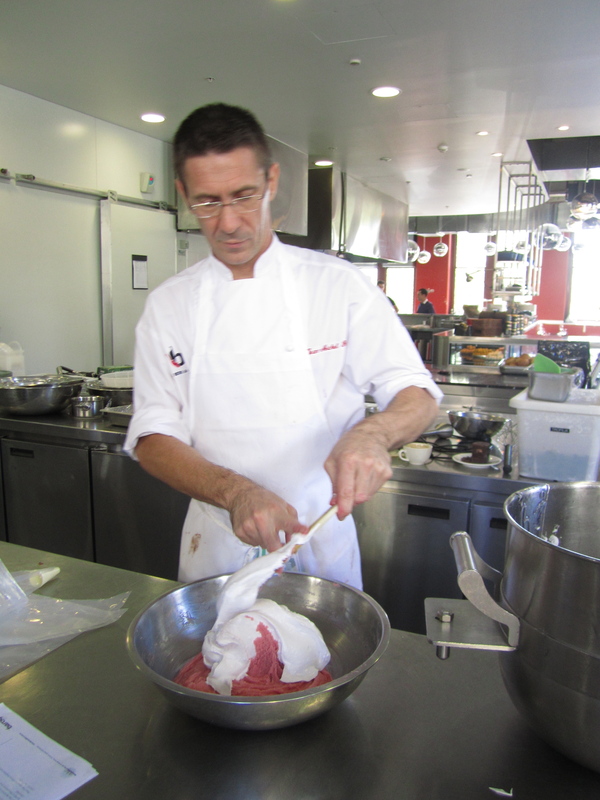 The next chapter of March was a fantastic macaron masterclass with Jean Michel Raynaud (also referred to as Sensei JM for his total mastery of all things sweet). 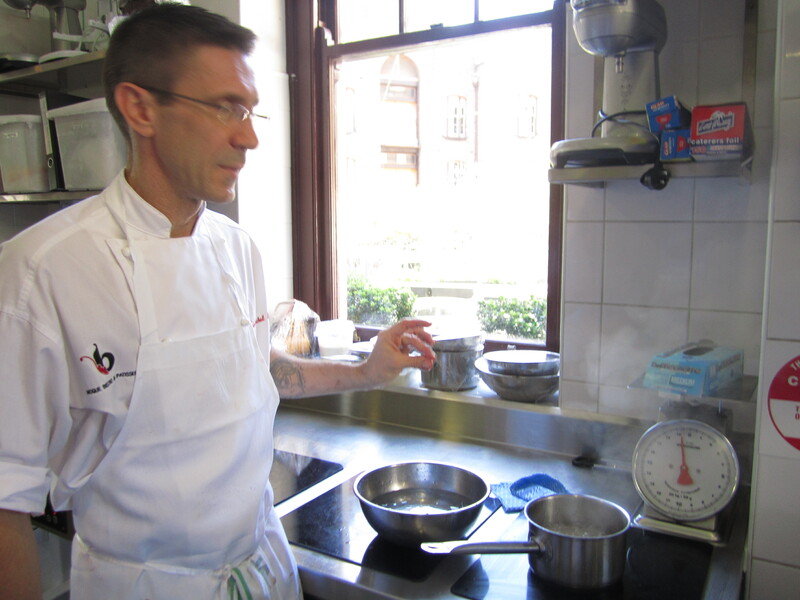 Class was held on a sunny Sunday at Sydney’s Baroque Bistro and I rocked up with one of my best friend’s husband, Nav, who is a bit of a budding Zumbo (sorry JM I know you probably just shuddered reading that! :P). Being back in class with Sensei JM was great – mainly because he was in his usual hilarious form but also cos I got to hang out with my friend Michelle from Cake Craze in Newcastle again. Class kicked off with intense theory and JM gave early warnings of potential moments of “blank faces” or “glassy eyes” because he likes to delve into technical stuff. Personally this was the best part of the class for me! 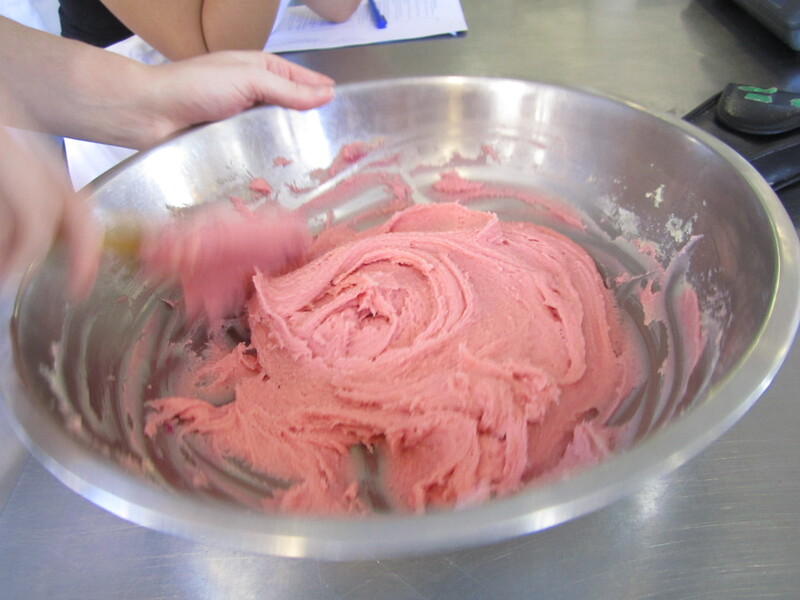 Here are my top 5 Macaron Myths Busted from the masterclass! 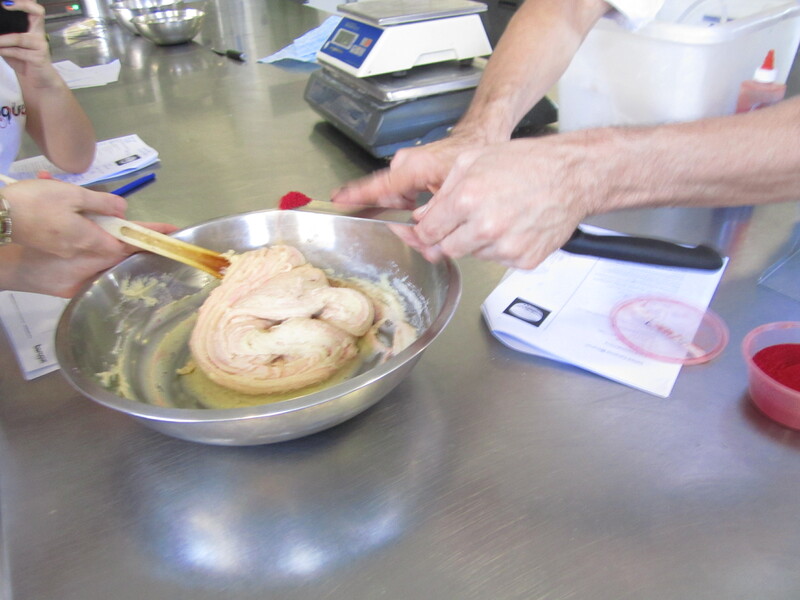 Perhaps one of the biggest myths to JM dispelled for me was the “croutonage” concept which a lot of books say you need to do in order to form a “skin” on the macaron so it will rise in the oven to form the little foot at the bottom of the macaron. JM said this is a complete fallacy and proceeded proved to us was totally wrong in the class. For those who have read my previous “Macaron Madness” post, you’ll note that I too fell for this major myth!! Note however drying the macarons after you pipe them isn’t COMPLETELY wrong. 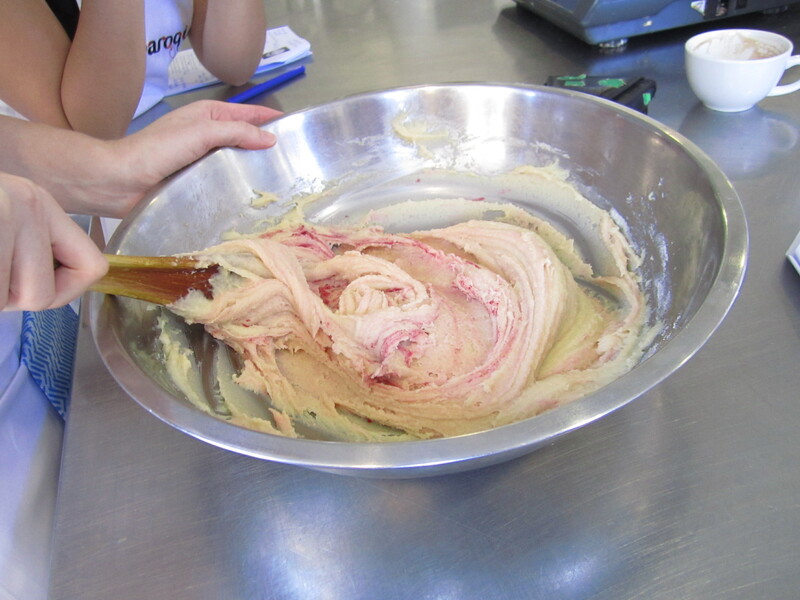 French macarons still require this time to dry because there is no cooked meringue mixture in the batter. 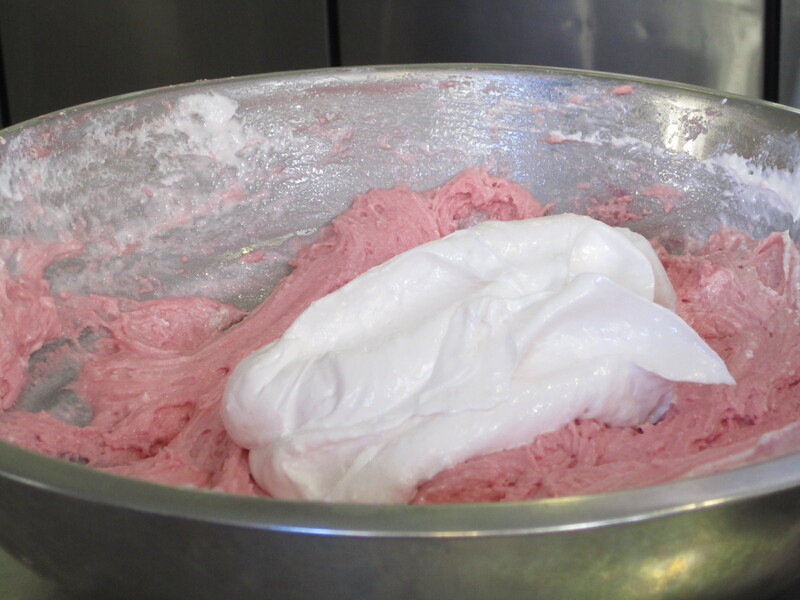 However because of the cooked sugar used in the meringue for the Italian macarons, the longer you leave them to dry the more the sugar will crystallise and the quicker you lose the shine on the macarons. Major lightbulb moments happened for me when we covered this in our class. 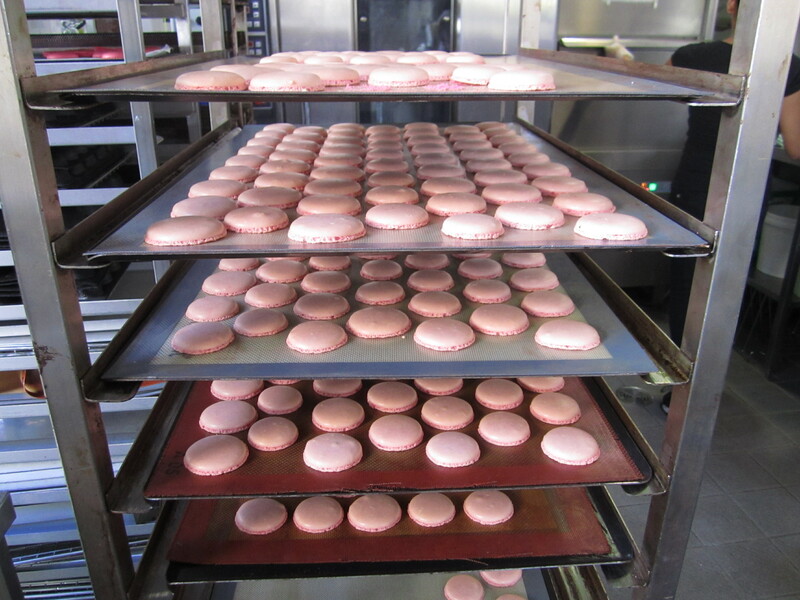 Sensei JM puts the macarons immediately into this mammoth oven without drying and they still come out with perfect feet! 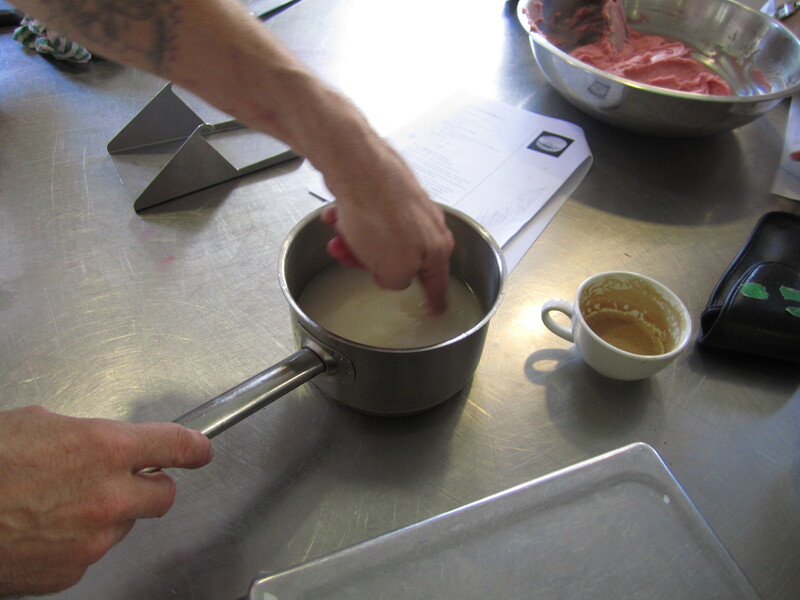 “Water fiiirst people!” was JM’s mantra during the sugar syrup preparation process. I once killed 3 batches of my sugar syrup with crystallisation. Each time I couldn’t work out why even though I googled the scientific basis behind crystallisation. Was it a dirty pan? Washed my pan and it happened again. Was it sugar on the side of my pan? Brushed down the sides with water and it still happened. Was it my thermometer? Cleaned it off and it STILL happened. This is by far my most feared downfall in macaron making. Turns out all you need to do put the water in the pan first and NOT stir the sugar whilst it’s boiling. 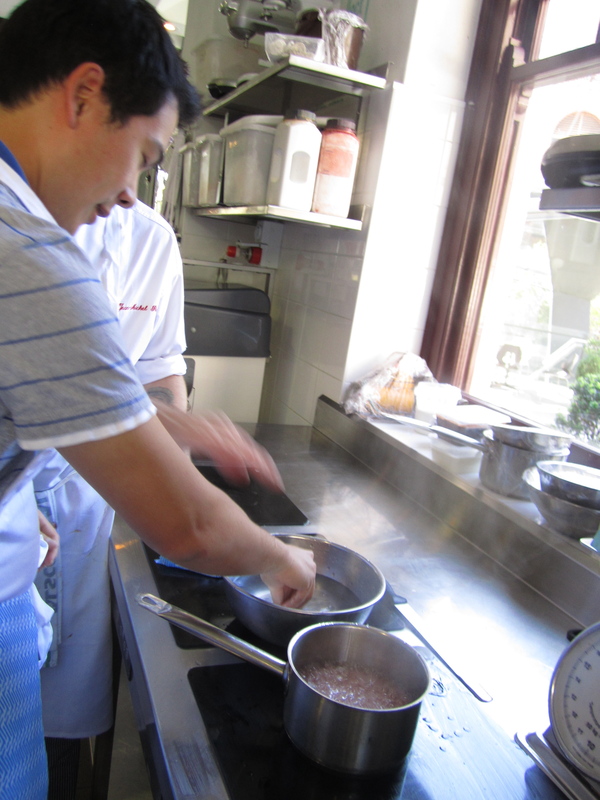 A simple trick is to also stir gently with your finger before putting to boil at a high heat. This is how you prevent the crazy growth of sugar crystals spreading like some unstoppable disease across your pan. Having a clean pan and brushing the sides down with water with your finger also helps. 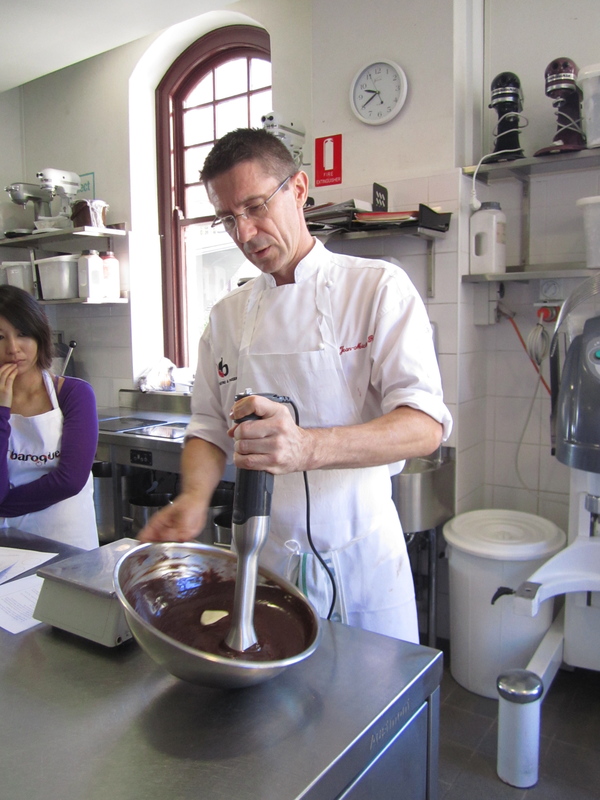 JM’s method hasn’t failed him for over 20 years so I think I’ll be doing this next time I make my macarons..
“Emulsion, emulsion, emulsion people…” When it comes to fillings ganache is by far the most popular in Australia. However there have been a number of times where I’ve thrown out seized ganache (where the chocolate and cream have separated). Now I’ve learned the way to rescue it! More water, less fat and then…. emulsion, emulsion, emulsion. 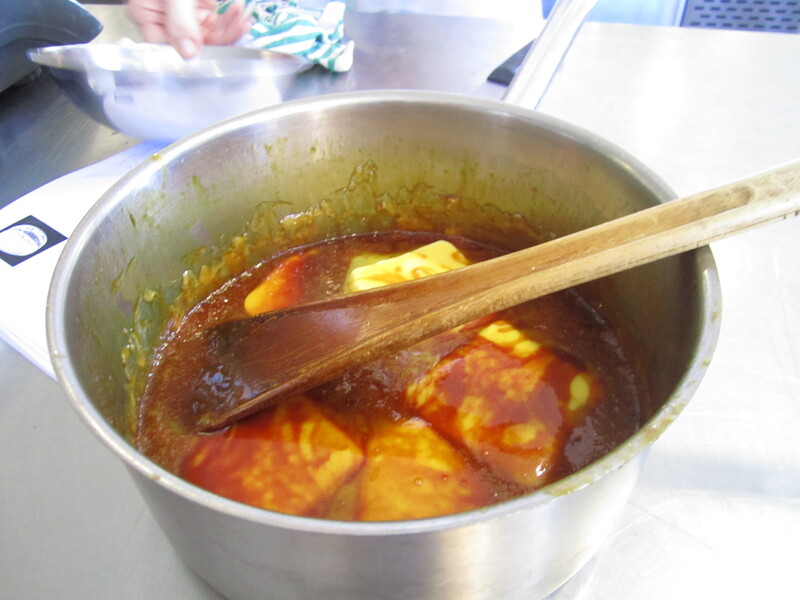 To emulsify means to combine fat with water. 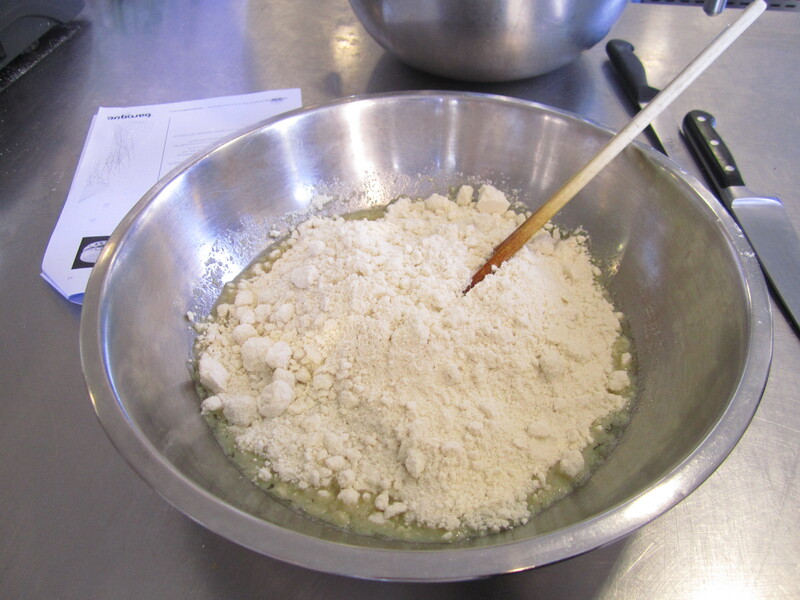 It’s labour intensive but it’s also how most macaron fillings are made. 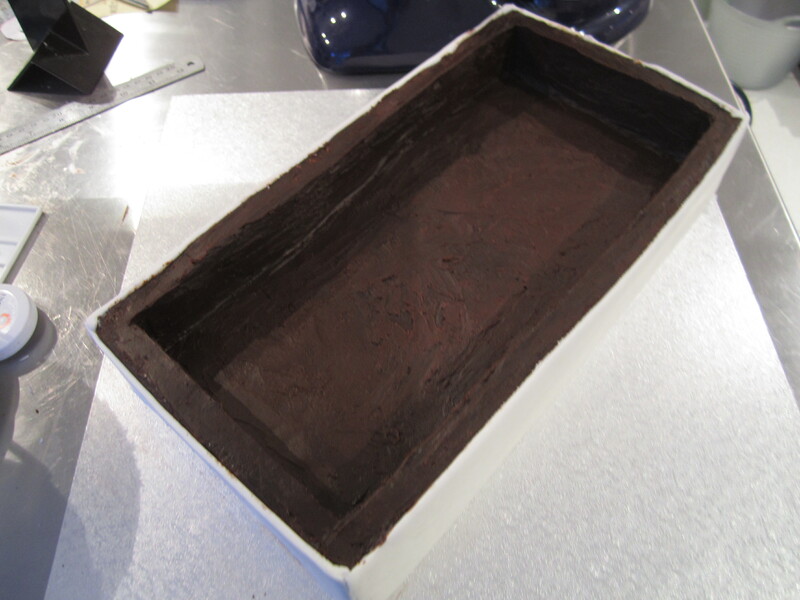 Adding a little water and re-combining the ganache can help to save it… I’m definitely trying this next time! 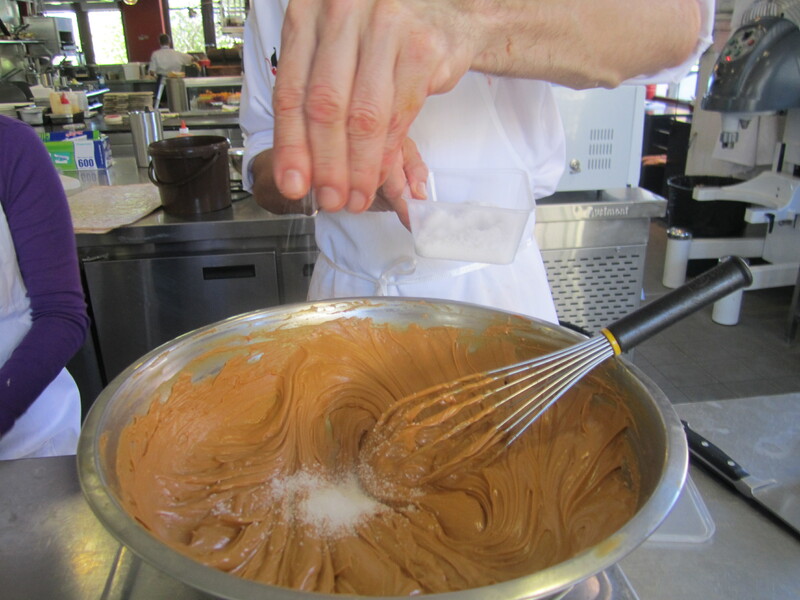 Emulsion is also an important concept for achieving beautiful salted caramel which is what JM has become famous for. Lots of emulsion and a shedload of butter of course!!! 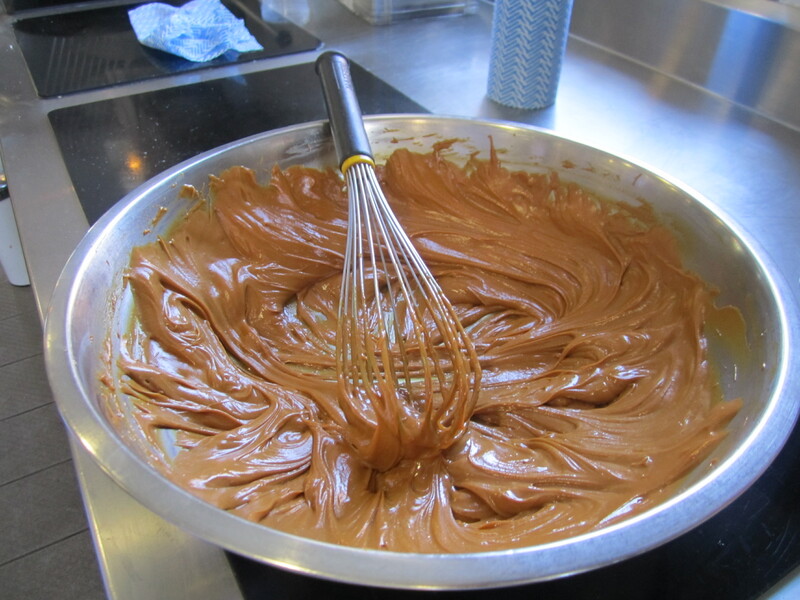 Notice also how the colour of the caramel changes from quite a dark colour to a light brown colour with more emulsion. 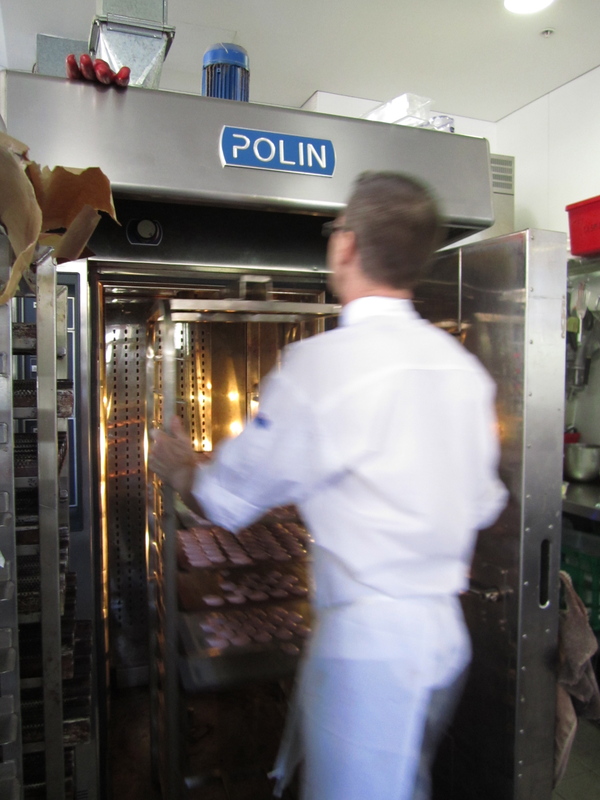 It’s a process that will definitely give you RSI but the taste is definitely worth it!! 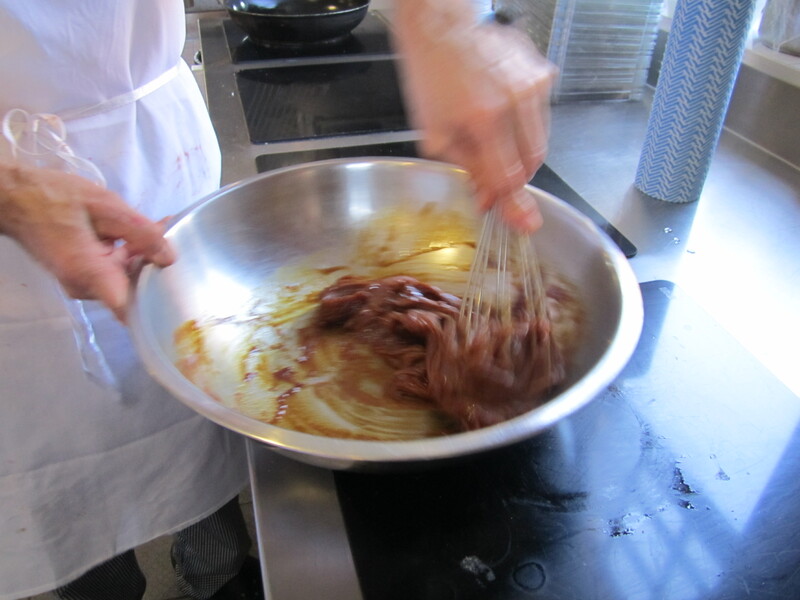 Sensei JM adds the final touch of Fleur de Sel to the caramel after emulsion.. 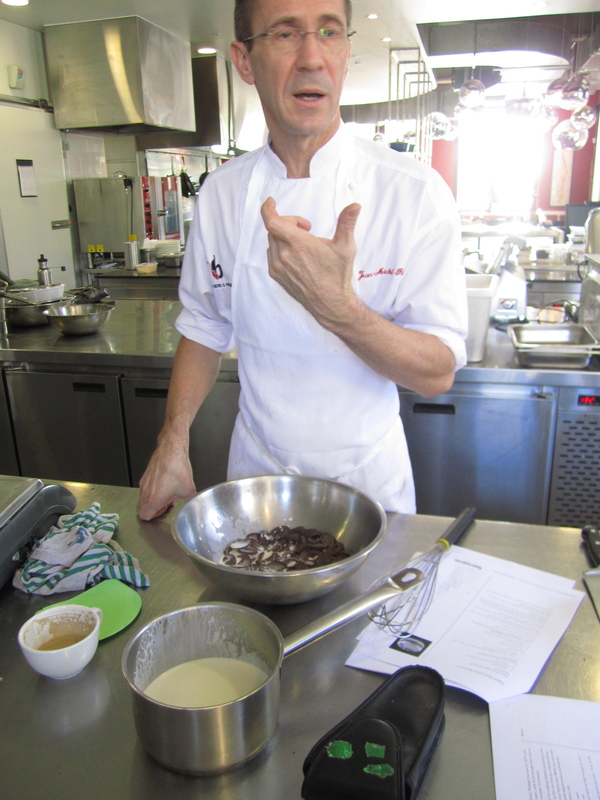 The last major “aha!” moment was the process of working the batter and how to detect the right consistency. It’s a little hard to explain in words but essentially beating and mixing then folding until glossy is the way to go. The shinier your batter the more likely you’ll be to have shiny macarons. 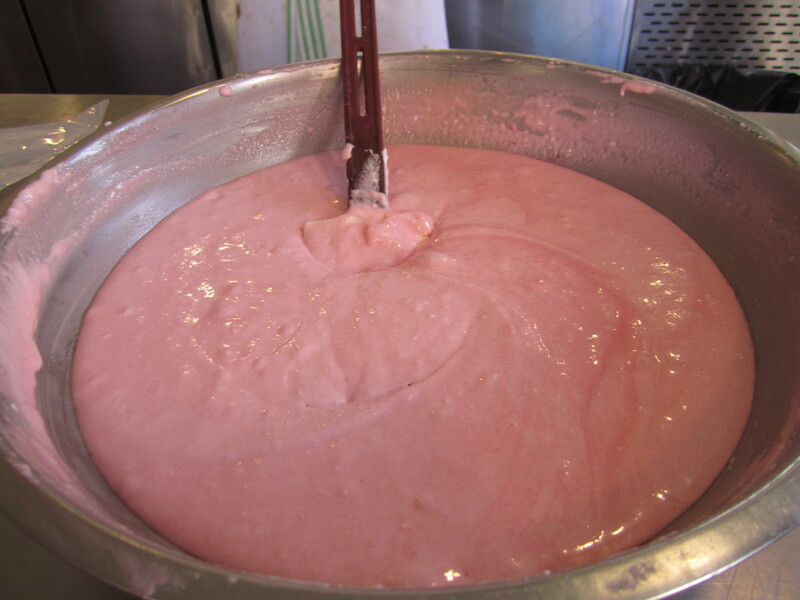 This is because the tant pour tant(TPT) mixture has been well combined and any lumps remaining will likely sink to the bottom. I had always avoided folding and beating the mixture too much because I was afraid of incorporating too much air but turns out that by mixing it a little more than I would have you get better results because you’re essentially breaking the albumin in the mixture down. 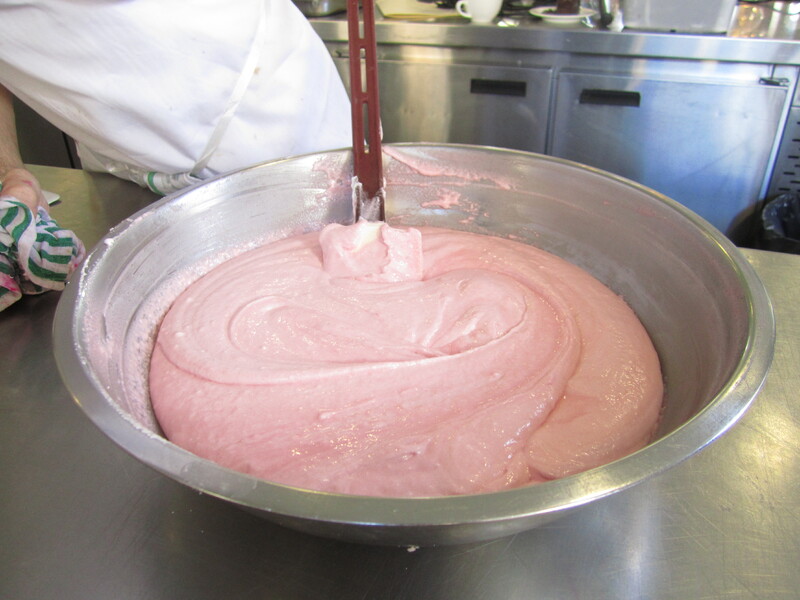 Macaronage begins…until thick and glossy! Not true! So this was the coolest part of the class. Watching JM dip his fingers in ice cold water then rapidly grabbing boiling sugar at well over 118C out of the pot to demonstrate what stage it was at. We observed all the stages of sugar from thread, soft ball, hard ball, soft crack and hard crack as JM dipped his fingers into the sugar over and over again playing with the little balls of sugar and throwing them onto the counter to demonstrate their consistency. Meanwhile I was freaking out wondering why his fingers weren’t burning!!! 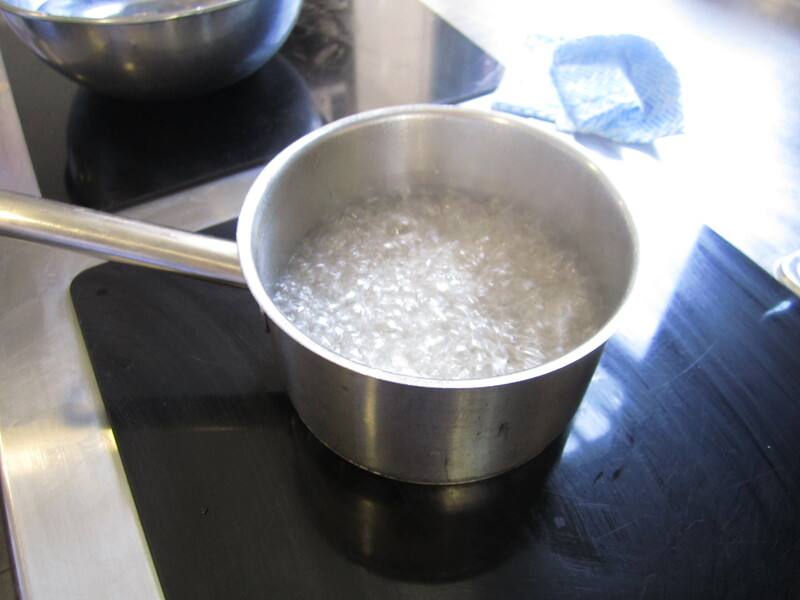 Turns out that it really doesn’t matter what stage the sugar is at – you don’t need to watch the thermometer like a hawk until it reaches 118C (soft ball stage) – just adding ice water back into the sugar mixture will actually bring the temperature back down if you are under. So as long as you don’t pass into the “carbonised” (burned) stage your sugar syrup can always be saved! Hmmm… this could be a whole new area of interest for me…. I highly recommend learning macarons with Sensei JM if you’ve never done it before – it saves you a whole lotta heartache and pain and you also take home a stack of macarons to enjoy and share with your family. And even if you have it’s still worth learning and observing all the tips and tricks that you can’t pick up through books or reading. 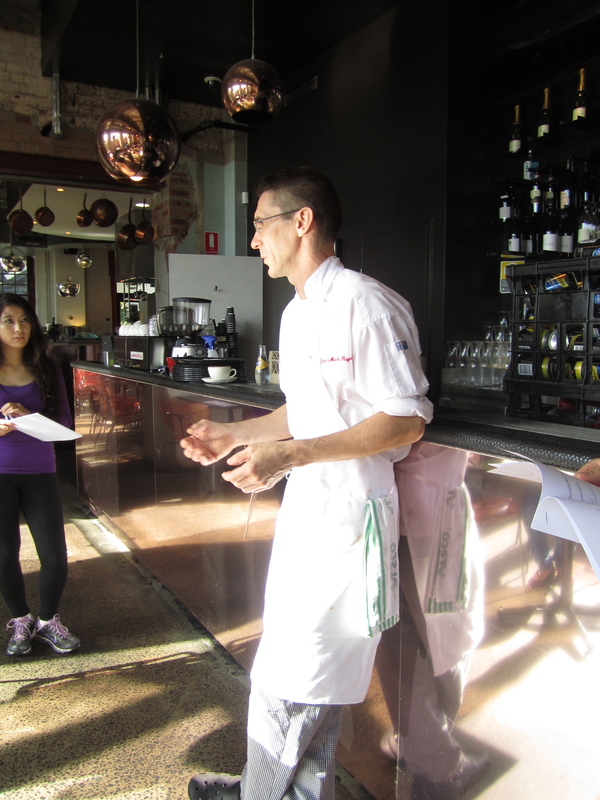 They even give you your own apron and a funky little certificate to keep which was a nice touch! 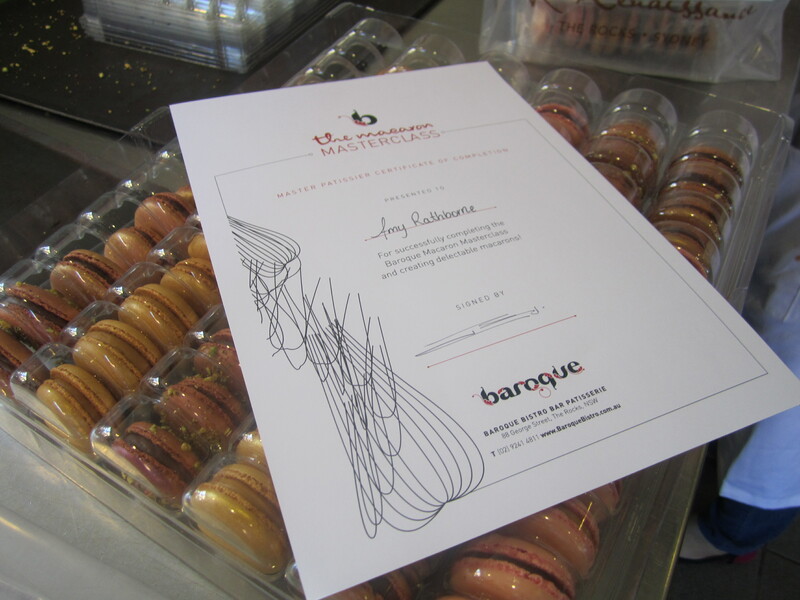 Check out Baroque Bistro’s site for information and click here for more pics from the class that didn’t make the blog. 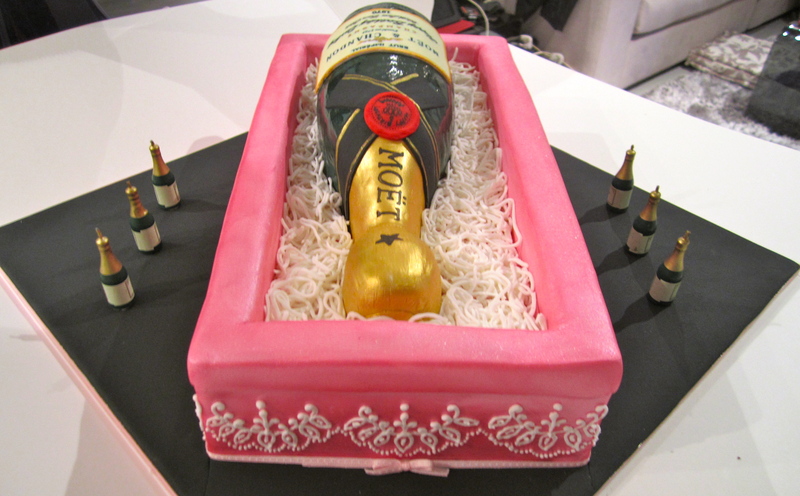 Stay tuned for some more March madness … some big developments in this little Cakespearare’s world are coming up soon!